Brahmin (GSB) sects are the main disciples of this Math. Goa did not improve for Hindus. Shrimat Sachidananda Saraswati Swami Gauḍapādāchārya. Saraswat Brahmins into 2 groups. handed over to Shrimat Sachidananda Saraswati Swami Gauḍapādāchārya. stayed in Sonavade Math in Ratnagiri. Ponda, Goa, which in those days was a part of Sonde Kingdom, under Hindu rule. headquarters of the Shri Saunstan Gauḍapādāchārya Math. Saraswat community and later founded new Math called Chitrapur Math in 1708. Brahmins and followed Smarta tradition . started following these new Maths. profound Upanishads, or mystical Vedas, consisting of just 13 prose sentences. Chudamani. Shri Adi Guru Gaudapadacharya was his Guru (Teacher). Shankarachaya stays with his Guru for some more years and mastered the Vedanta. Sanskrit. The Birudāvali of Shree Swami goes like this. Birudāvali will change depending on the Swami addressed. our respectful obeisance now and forever’. 1) Lord Narayana 2) Lord Sadashiva and 3) Lord Brahma. 1)Vasishta Maharishi 2)Shakti Maharishi and 3) Parashara Maharishi. 1) Acharyas start with Sri Gaudapada Acharya. initiates him as a sannyāsin, and appoints him as the head. Math is as given below ,. 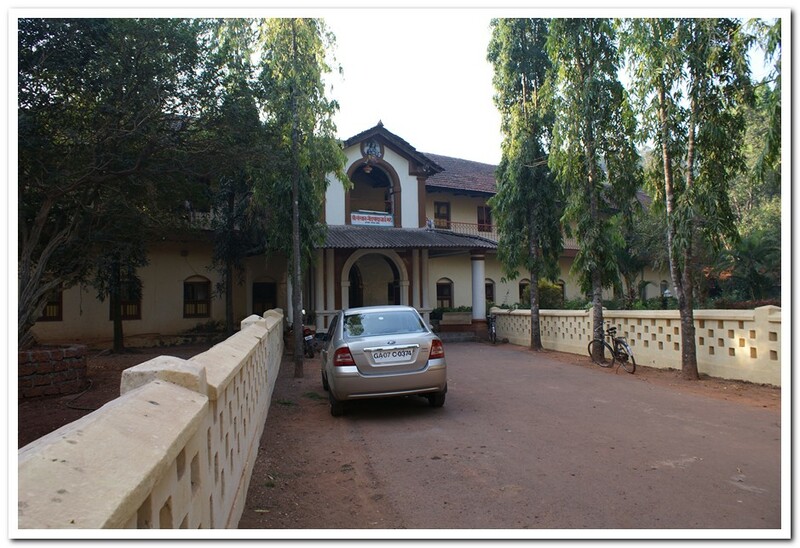 Headquarters of Shri Gauḍapādāchārya Math Building at Kavale, Ponda, Goa. Headquarters of Shri Gauḍapādāchārya Math Building at Belgaum, Karnataka. Shri Gauḍapādāchārya Math branch at Chinchewada, Sadashivgad, Maharashtra. Shri Gauḍapādāchārya Math branch at Gokarna, Karnataka. Shri Gauḍapādāchārya Math branch at Ankola, Karnataka. Shri Gauḍapādāchārya Math branch at Halage, Karvar, Karnataka. The Kavale Math has following branches/Ashramas . Soundha of Sonde Kingdom who ruled at the time. 2. Kashi Math: K22/58, Durga ghat, Varanasi ([Kashi]), U.P., Pin – 221 008.
rupees from the former Indore state. 5. 91, Banaganga Tank Road, Malabar Hill, Walkeshwar, Mumbai, Pin – 400 006. Rupees along with records of grants given to Math. Satroji Rane had built this Math in Saka 1722.
for maintenance of the Math. Shivanand Saraswati swamiji the 73rd swaimiji. Saraswati Swamiji, the seventy fourth Swamiji. 13. Main Road, Shree Kshetra Gokarna, North Canara, Karnataka Pin – 581 326.
from Shri Gokarn Math and Chtrapur Math were also present at the occasion. 15. 45, Somavar Pet, Tilakwad, Belgaum, Karnataka, Pin – 590 006. 16. Lakshmeshwar, Ankola, North Canara, Karnataka, Pin – 581 314. Shrē Vithal Rakhumai temple at Kavale Math. Shrē Uma Maheshwar temple at Khanapur Math. Shrē Mahakali and Muralidhar Gopalakrishna temple at Walkeshwar Math, Mumbai. Shrē Bhavanishankar temple Sonavade Math, Sindhudurg. Shrē Sita Ramachandra temple at Brahmavart Math, U.P. Shrē Bhavanishankar temple at Chindar Math, Kankavali. Shrē Venu Gopal at Kashi Math, Varanasi, U.P. Shrē Vithal Vishveshwar temple at Halage Math, Sadashivgad. Shrē Sharadamba temple at Sadashivgad Math. Shrē Chakravarti Shivaling at Gokarna Math, North Canara, Karnataka. Shrē Shree Datta Mandir at Ankola Math. Source : Kavale Mutt website / Wikipedia.